The tranquilty, space and view anabled us to enjoy a four day stay in this beautifully restored house. Property management staff members were very professional and great to work with. The owners came by more than once to ensure we had all we need need and were very helpful to supply information on house, area, things to do etc. A minor water and internet problem was resolved right away. Thanks to All for a very enjoyable stay. 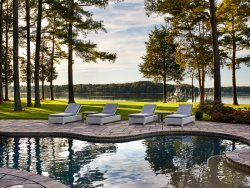 As a return vacationer with ESVR, we have come to expect beautiful properties in exceptional locations. Indian Fields did not disappoint! We didn't want to leave.... ever! A beautiful home, spacious, comfortable, to die for views... Loved it! Loved it! Got 3 families together for a new year's reunion and the house was a perfect fit with large rooms on main level to eat and relax. Views are amazing, but only really accessible from large kitchen windows in winter (other windows are small as they are original to historic home). House was cozy warm with 2 gas fireplaces in addition to regular heat.Friendly owners live next door so were quick to come start hot water when we discovered it was off upon arrival. Only improvements could be more tableware/utensils for feeding all 13 guests. This was such a beautiful location, the pictures do not do it justice. the kids and dog could not have been happier and they loved walking on the dock and checking out the fish and skate in the water. The owner, Leonard, came to see us and gave us a lesson in catching and picking crab. It was fun and delicious. We can't wait to come back for even longer next year. Our family of 10 had a most enjoyable vacation at Indian Fields. The view was incredible and we enjoyed many cool and breezy evenings on the porch overlooking the water. The pool was nice but not heated so it was chilly (thanks to a cooler-than-normal summer) but the kids didn't mind! The little private beach was a huge hit with young and old for floating on rafts, building sand castles, and collecting sea glass. So peaceful with wide open views to die for!The owner was very friendly and accommodating and genuinely wants guests to enjoy themselves and the property (he encouraged to make use of whatever was in the unlocked garage including several big crab traps). His grandchildren are co-owners and you might see them maintaining the property throughout your stay. They are very hard-working and polite.However, we were troubled to learn -- mere days before our arrival no less -- that this property has limited wifi (not spotty -- we expect that on the Eastern Shore -- LIMITED meaning after a certain undisclosed amount, it would be shut off), window A/C units (but none in the kitchen which got HOT even though the outside temps were in the low 80's), and well water with poor water pressure (meaning we had to stagger our showers, laundry, dish washing). None of these were deal breakers but we would have appreciated being informed of them earlier in the process and they were certainly inconvenient. The toilets clogged frequently as a result of the poor water pressure and two of the showers were useless due to such low water pressure (it was impossible to rinse out shampoo). We'd also suggest providing a few more pillows. Each bed had one per guest (which is fine for twins/ kids but a queen bed should have more than two pillows! ).Tip: the white fence, stables, and trees on the way up to the house make stunning backdrops for family photos. Great house, great location! We had a wonderful time and will definitely consider this house for the future. One minor inconvenience was the showers upstairs did not run warm water very well. Luckily it wasn't cold outside, so it wasn't a big deal. Very charming old house with lots of character. The owner Lenard and Owen were very nice and helpful with every little thing.Lenard gave us a lot of great tips on where to buy crabs from the crabbers. We had a great time. We had a great time, the house was clean and well maintained. The pool, dock and property was well maintained. Kids had a great time swimming in the pool, collecting shells and riding scooter on basket ball court. This property was perfect for our group. We were looking for a good value and found it in Indian Fields. It is no frills, furnishings are somewhat sparse and the kitchen isn't particularly well stocked (ie: silverware) for the number of guests advertised. But the patio and pier on the Choptank more than made up for that. The price was well below that of other comparable properties we were looking at so we were very pleased in the end. I would not recommend it if you are looking for the fanciest place but it is perfect if you have children or others that would make you worry about breaking anything during your stay. Great Property, wonderful water. Nicely redone. Very new to the rental market so some items were not available but the owners were providing them as asked for them. I think it will be a great rental with no issues once they work out all the bugs. I will go back. We had a few families share the Hudson manor over labor day weekend and it was a great experience. The pool, hottub, screened porch, firepit, swings fit the kids and being right on the bay made our vacation so much fun. We hope to do it again next year. A fantastic property with spectacular views, plenty of room to play & relax. Plenty of room for our 15 adults, 5 small children and 1 dog. We had a marvelous week kayaking, canoeing, swimming, playing corn hole, bocci, etc. Looking forward to repeating next year. Great house in a great location. Entire stay would have been rated a 5 star if not for the frustrating condition of kitchen utensils, small appliances, cabinets among other things. For the price one pays for a week at this house, the owner should seriously consider investing a few hundred bucks to upgrade with sharp knives, a working can opener, new knobs for the stove which are wearing out and sometimes need to be moved around to get the burners to turn off (we spent 1/2 hour turning off the right back burner one night). Cabinet knobs are very loose and at time come off in one's hand while opening (we tried tightening to no avail. No scissors unless they are in drawer next to the fridge which is stuck. No complete set of measuring spoons or cups. The hand mixer has ill fitting beaters that make it impossible to use with both beaters. Only one side of the toaster works. No stick frying pans are dead and pretty disgusting. Lids that fit no containers and containers that have no lids. The freezer light is out. Outside the kitchen - the lights above the sink in the first floor bathroom all blew the first day, the stopper in the 3rd flr bedroom does not work, there is a broken chair in the living room. $9000+ for a week should buy us a pleasant kitchen to work in, not the frustration. I would not recommend this house to anyone until these simple fixes are made. The house was wonderful - plenty of space and activities to do. The location and views are amazing!Rental company was responsive for the most part.Home is older and has some issues (many little steps inside are difficult for elderly), some blinds broken, a few chairs in living room broken, swing set was unsafe, the internet is sketchy (this is a plus too).We had to wait 1 hour 45 minutes before rental co. got back to us with the code for the lock box. Our church group loved the beauty and serenity of the home but we had very little wifi the whole weekend. We were promised a new router but it never came. Two of the burners on the stove were not working and there were a few broken or loose doorknobs and a screen door off track. The home is beautiful and if these things are corrected it will be almost perfect. The property was beautiful. Check-in is about 30min away so that was a pain. The place itself was nice, there were no linens on any of the beds but a quick call to the office and it was dealt with. The fireplace out back was destoyed prior to our arrival and the vanity in one of the rooms was broken. Luckily, I stayed with two general contractors who not only fixed the vanity, but also re-laid the stone for the fire place. Good as new. The one issue we did have, and I'm not too certain if this is a location thing or not, was the fruit flies. I have never seen so many fruit flies in my whole life. We set about 10 traps and they were still infesting the place. Overall, for the money, I felt the place could have been better. I don't think I would stay here again in the future. We put 18 folks, from grandparents to a 3 year old in the house and had a fine time. With a little rearranging, even the dining room took us all at one time. The pool was great for the kids and they enjoyed fishing from the pier. We had a superb time at this lovely property. At the end of the week we had a mild medical emergency and found the response immediate and extremely professional. We would rate this one of our best vacation stays. The house was great. We will definitely come back again. We rented the house for a retreat weekend and all had a wonderful time. The house is on a great piece of land which allowed for a variety of sports activities and lounging. The house is very well stocked too. It was an awesome place and I will come back. After my daughter was married we wanted to give the families a chance to get to know one another. 4 nights in Hudson Manor was just what we needed, fires outside, a huge sunroom that all 17 of us fit in to gaze at the water all day long until a beautiful sunset, a lot of card games on the big dining table and some pool games that were very entertaining. Lots of bedrooms, bathrooms and space to hold a group or to go off by yourself and sit in a quiet spot. You can't go wrong with Hudson Manor MANAGER RESPONSE: Please note - this particular guest had a wedding off site and used the property as a place to congregate the weekend after the nuptials. Our homes do not allow for weddings or special events. We had a big group of 20 and everyone was very comfortable. We were out east for the WORLD GOOSE CALLING CHAMPIONSHIP and Waterfowl Festival in Easton MD. Can't thank Jess enough. She made it all possible; very easy to work with.